Kabwum Valley is in the Huon Peninsula, 115km north-east of Lae, Morobe province. The valley is surrounded by the scenic Cromwell Mountains on the north-east and Saruwaget Ranges on the north-west end. Both contain large alpine and rain forests with high biodiversity and wildlife sanctuaries. Coffee farms are scattered on the foothills of both ranges stretching coastward towards Wasu port. Ideally, Wasu port handles all coffee moved out of Kabwum Valley. Coffee was introduced to Kabwum Valley by early missionaries in 1950’s. Komba, Timbe, Selepet and Urua/Yopna tribesmen - who make up the population of Kabwum - grow this very important cash crop intercropping with taro, banana and other tree crops with no chemical fertilisers. Currently, 100% of coffee is sold as “conventional” to agents representing major exporters in Lae, Morobe province and Goroka, Eastern Highlands province. With the closure of Wasu Kabwum coffee mill in 1998, coupled with the constant changes in New York “C” coffee prices, these agents took advantage and paid less than New York “C” prices to the growers, taking large slices for themselves or their processors and exporters. Lack of transportation and communication infrastructure added to the worsening situation for Kabwum coffee growers. They struggled to make a living from this most-important cash crop, and most growers abandoned their villages and drifted into urban centres. These are the producers of the second most-traded commodity in the world. Out of this structural inequality in Kabwum’s coffee industry, Cromwell Sustainable Coffee (CSC) Ltd was born on August 23, 2005, under the IPA Business Registration Act 1997, and commenced operation in October, 2005. The main objective has been to act as organic operator under the standards of National Association for Agriculture Australia (NASAA), a third-party organic certifier based in Adelaide, Australia, to assist smallholder coffee growers develop and promote the certification, production and marketing of certified smallholder grown organic coffee from Kabwum. Cromwell Sustainable Coffee Ltd is headed by Ferro Muga as managing director. Mr Muga holds a degree in Bachelor of Science (food technology) from Unitech, Lae. He graduated from the University in 1982 and joined Ramu Sugar Ltd.
During his 22 years of service (1983 – 2005), he has held many senior positions, the latest being distillery manager managing the Ramu Sugar ethanol processing plant. “CSC, acting as organic operator under NASAA standards, has initiated this organic coffee venture because, although the smallholder growers grow coffee with no synthetic chemical fertilisers, they cannot be considered for market certification purposes because many countries now regulate organic coffee trade,” Mr Muga explained. “ To sell coffee as organic, the producers and processors must work within and be certified by certification bodies most often according to the standards that meet or exceeds the International Federation of Organic Agriculture Movement – IFOAM - basic standards. “This requires a system of regular inspection and certification that helps to ensure the credibility of organic coffee and help build trust in the market place. IFOAM – International Federation of Organic Agriculture Movement. An over-arching international body that accredits certification organisations and sets standards for organic coffee certification. “Initially, CSC has committed its finances to purchase parchment coffee from growers and re-sell to exporters in Lae to generate funds to embark on the organic coffee venture,” Mr Muga said. “There are 30 grower groups (villages) within the operational area each with an organic inspector and an assistant. “The membership is approximately 3, 500 and still growing. Set up internal organic control system to facilitate organic inspection/verification. Community electronic network by way of VSAT stations in several key locations in Kabwum District. It is in planning stage. “To date, most of CSC’s coffee has been sold to New Guinea Coffee Tea & Spices Ltd, Lae, and New Guinea Highlands Coffee Ltd, Goroka, under green bean contracts,” Mr Muga said. Fuzzy Wuzzy Expeditions, a 100% Papua New Guinea-owned trekking company, is the new kid on the block that’s taking the Kokoda Trail by storm through the Internet. 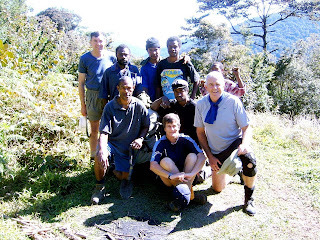 It’s a far cry from early 2004 when I first met an enterprising young man named Defol Jabbar(pictured second from left, back row, with a group of trekkers and porters along the Kokoda Trail). He had just set up his new trekking company and the next three years would be a steep learning curve. Mr Jabbar has slowly but steadily been building up his client base since 2004, albeit, without a professionally-designed website. His website http://www.fuzzywuzzy.com.pg/ was properly designed and uploaded last November and the sky is now the limit. Mr Jabbar, as far as I know, is the first Papua New Guinean owner of a trekking company to have a proper website. Many overseas trekkers and tourists prefer to use 100% locally-owned companies; however, the catch is that few of these companies are Internet-savvy. The lucrative Kokoda Trail market is dominated by foreign-owned companies, many of whom use Papua New Guineans as fronts, and Fuzzy Wuzzy Expeditions is indeed a breath of fresh air. It has already secured major corporate clients such as SP Brewery and Telikom, while the number of site visits and hits increases by the day. The situation for many Small and Medium Enterprises (SMEs) all over the world, including Papua New Guinea, is that an entrepreneur (such as Mr Jabbar) owns a small or medium enterprise. The company produces an interesting product such as organic coffee or arts and crafts, or provides a novel service such as taking tourists across the Kokoda Trail. The problem: How do we use the Internet to sell the product or service? The general methodology is to plan, analyse and enact E-marketing activities. This methodology can be used by anyone who wants to use the Internet to access customers. • Goals – What do we wish to achieve through E-marketing? • Resources – What resources can we expect to support our actions? • Actors – Who are the marketing actors in the E-marketing process? • Spaces – Where will our E-marketing take place online? • Actions – What specific E-marketing actions should we take? “We started in 2004,” Mr Jabbar says. “I got clients on an ad hoc basis. “My biggest problem was setting up a website. “At the end of the last trekking season, I felt that I had to build up a proper website. “I’m the first local operator on the Kokoda Trail to have a proper website. “There are about 20-30 operators, all of them foreign-owned, who have their own websites. “There are only a few local operators, and of these, I’m the only one to have a website. “Since the website was uploaded last November, there have been a lot of visits. “Without a website, I found it very hard to get clients. “Now that the site is up and running, I have been receiving a lot of querries. “Everyday, I get about 10-15 querries from interested people and trekkers, who want to make bookings for 2008. “As a local operator, my prices are very competitive. “My prices are very cheap. “I regard this as a very big achievement in my life as well as my own small business. Trail (between Gabagaba in Central province and Buna in Oro province). “I can also sell other tourism products from the Oro province on the website. Mr Jabbar is proud that corporate icons such as SP Brewery and Telikom are utilising the services of his company. In fact tomorrow, Saturday, January 19, Fuzzy Wuzzy Expeditions will be taking senior Telikom managers for a one-day “Kokoda Taster” from Owers Corner to Imita Ridge, returning the next day. “We are preparing to attract corporate companies in Port Moresby to encourage their employees to participate," Mr Jabbar said. “SP Brewery is the first company to support us as a local operator. “They have already done two Kokoda treks, one in May 2007, and the other in October 2007. “The general manager of SP Brewery and all his top managers did the trek. “They have three more treks coming up this year. “We thank them for their support. “Telikom is taking the ‘Kokoda Taster’ on the 19th of January. “Telikom PNG has five ‘Kokoda Tasters’ this year. “They want to get all their employees involved in this programme to get them fit, healthy and sharp-minded. “They are also planning two or three major treks in 2008. Mr Jabbar was a banker before being bitten by the tourism bug. “After I left the bank, I was mayor of Popondetta,” he recalls. “I walked as the research officer for (former Oro MP) Peter Oresi. “I saw the potential for tourism in Kokoda and decided to get into the business. “I set up the company in January 2004. “Now that I have a website, I think that I’ll do better in 2008. “I’m now looking at the possibility of building a guesthouse in Kokoda. “I have already obtained a piece of land in Kokoda for this purpose. Mr Jabbar can be contacted on email http://us.f529.mail.yahoo.com/ym/Compose?To=defol@fuzzywuzzy.com.pg or http://us.f529.mail.yahoo.com/ym/Compose?To=info@fuzzywuzzy.com.pg and mobile 6883231.